So I’m just sitting here by myself in the lobby waiting for breakfast. There’s no space in our room for me to work. I wonder what breakie will be like? 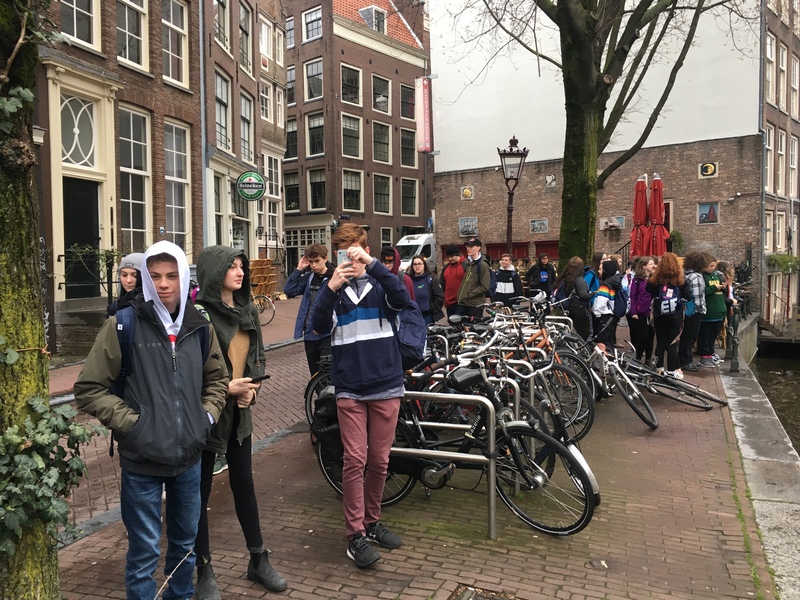 We have a busy day ahead of us today; a walking tour of the city, Anne Frank House and guided tour in the afternoon. 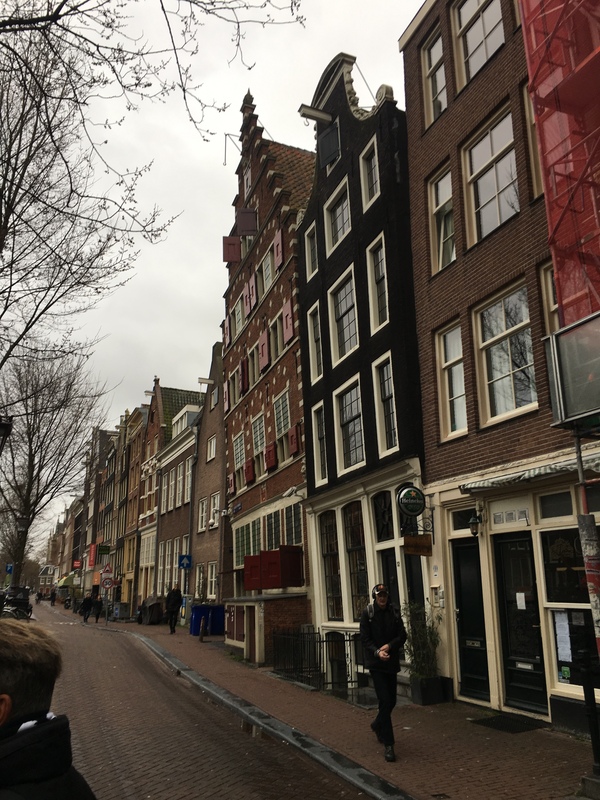 I am really looking forward to it; I love the city of Amsterdam. It is such a beautiful and historic city. I’ll check in later. Okay, so we’re on the bus heading back to the hotel after a very busy day. I’m not super tired, but my joints hurt. 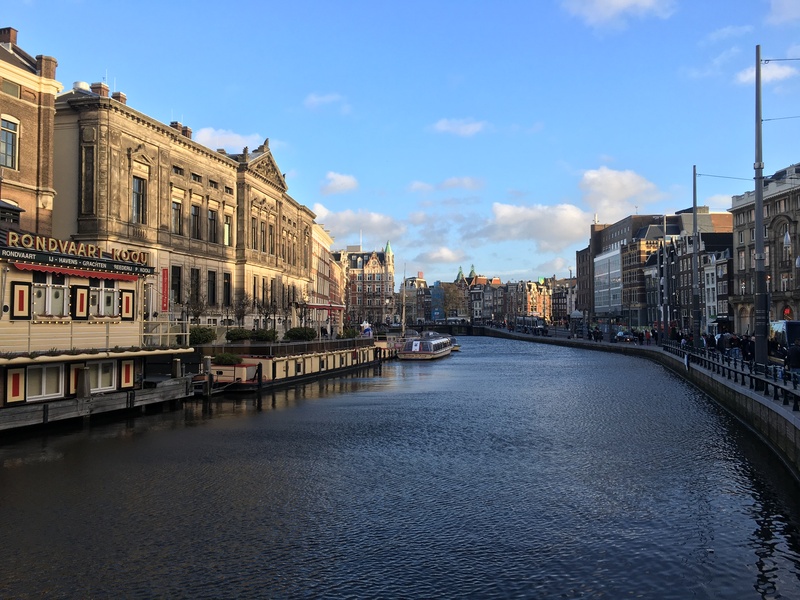 We were dropped off at the downtown train station (Centraal Station) and started our walking tour with Sebastian. 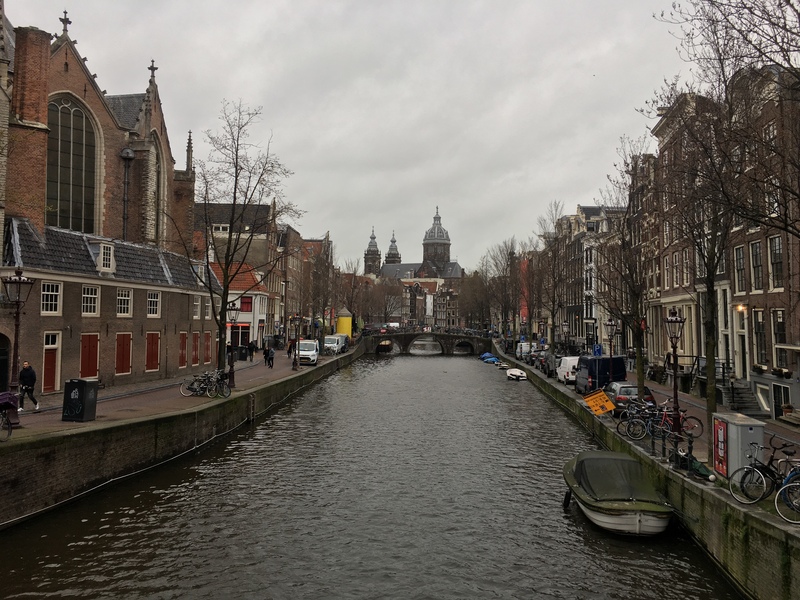 It reminded me how beautiful it is and how much I love the city of Amsterdam; it is definitely one of my favourite places to visit. I want to go back at some point where I will have more time to explore. So where did we go and what did we see? 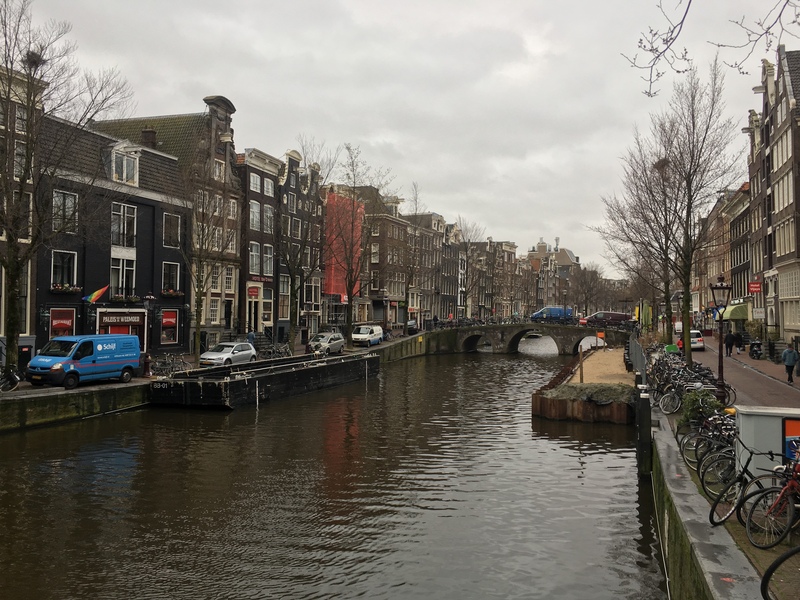 Well, Amsterdam is characterized by its ring-shaped layout and all the canals. 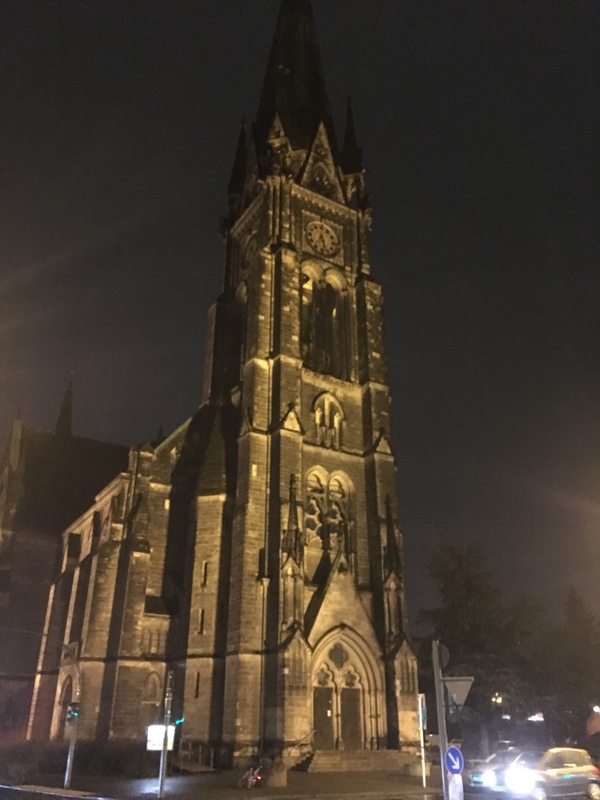 It was founded back in the 1200s and has amazing history and architecture. One of the best parts is when your students can see this for themselves, taking the teaching beyond the classroom. When you can touch the history, it really comes alive. 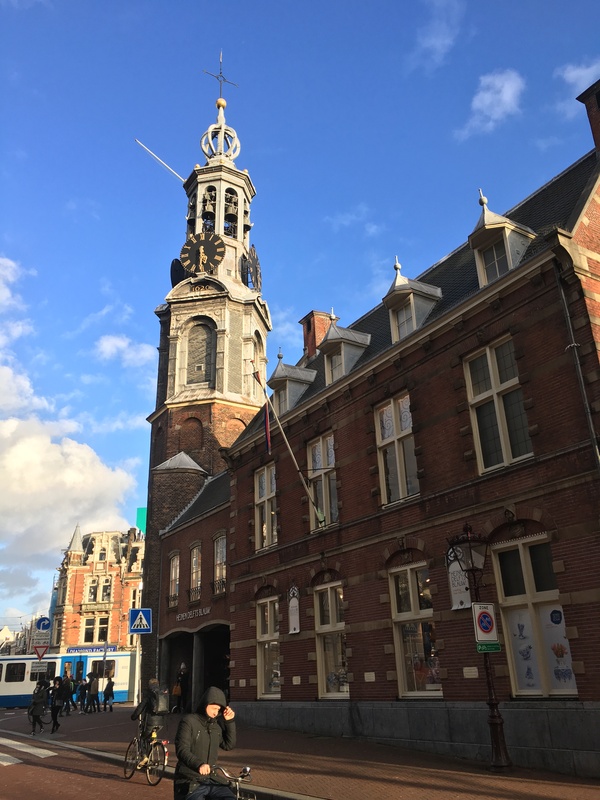 Anyway, we saw places such as the Royal Palace, Westerkerk and the narrow, winding streets of the city core. The only issue we had was, you guessed it, the weather. It was bitterly cold, like +3C but feels like -2 , cold. And damp too, which is probably why my joints hurt. The first part of the morning was okay, but then it started to rain. Ummmm, rain and cold…felt like football practice at the end of October, just we were stuck outside all day! 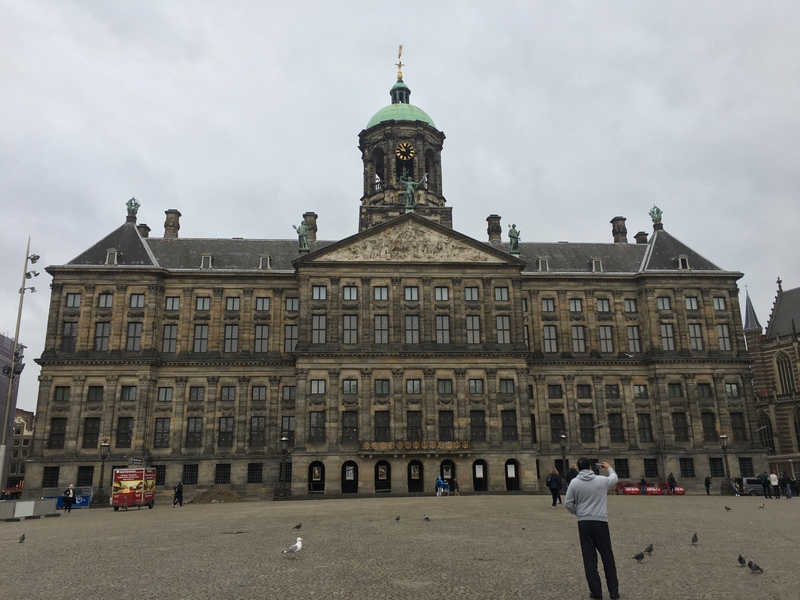 Royal Palace, Amsterdam, March 2019. 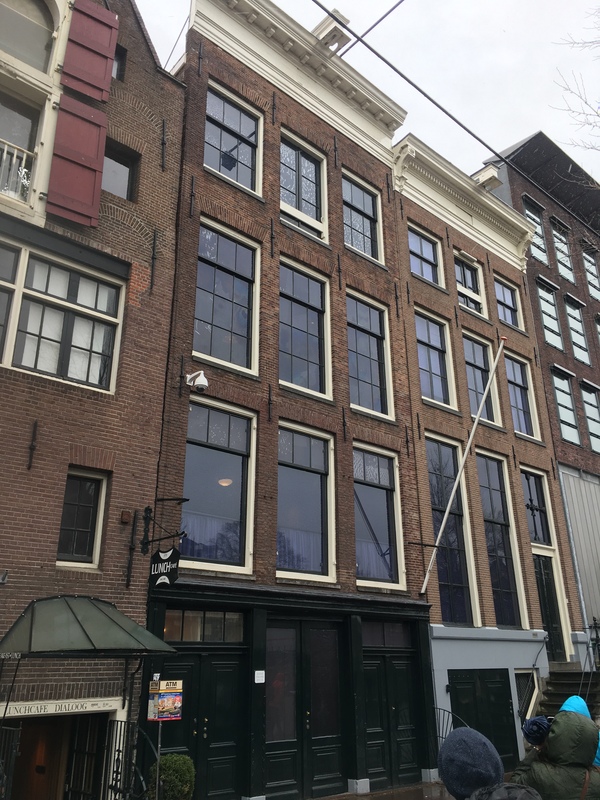 At 1100, we made our way to Anne Frank House (Anna Frank Huis) for a visit to this very touching memorial to her and the Holocaust. I know that a lot of the kids were looking forward to this place, having heard her story and maybe even read the book. It is always a very sobering location. Afterwards, many of them commented that it was a moving experience. 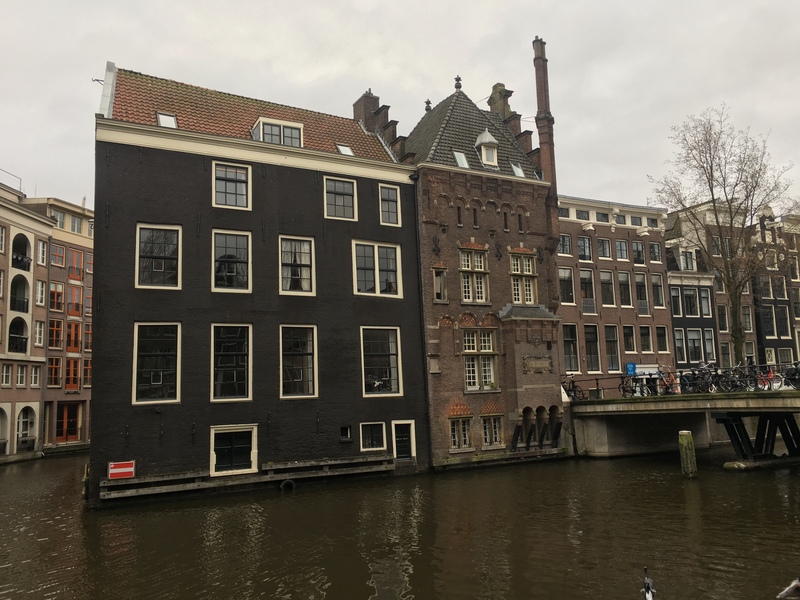 Anna Frank Huis, Amsterdam, March 2019. 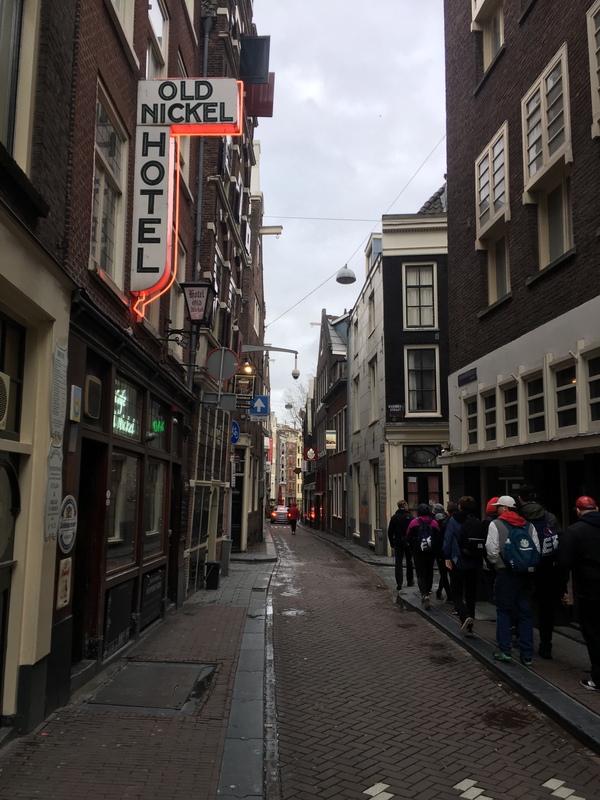 We had a break for lunch (in the pouring rain), which found myself and Mr. Marcon hiking back many blocks to find the least sketchy ATM we could and then meeting Ms. Caza for a bite to eat. I had a brie and some type of prosciutto sandwich which was fantastic. 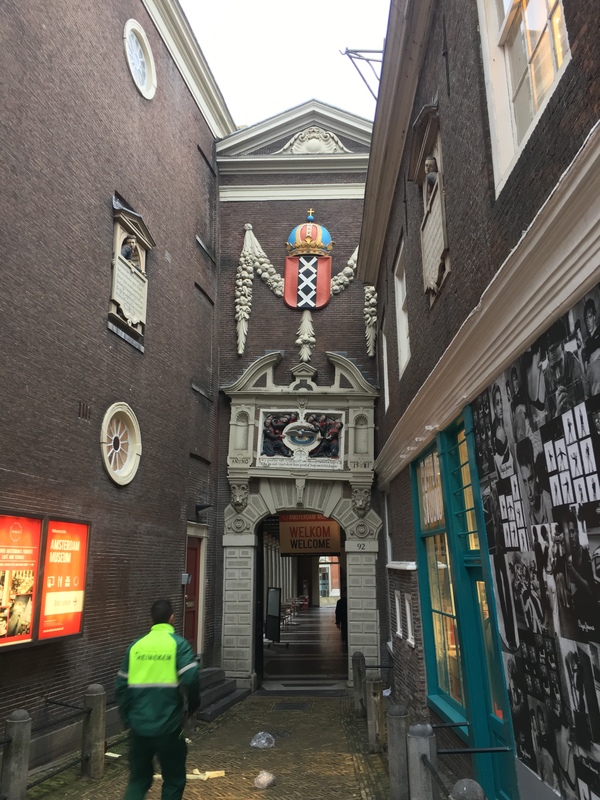 I stopped by a local shop before our meeting time at the Westerkerk to buy a few things for my boys. 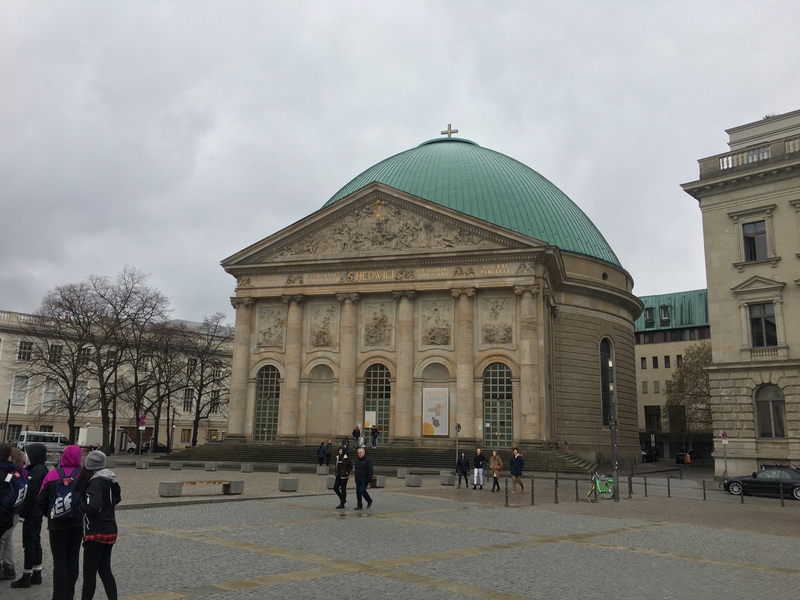 Our afternoon was taken up by a bus tour of the city with our guide, Gerwin. We had him as a guide on our 2014 trip and he is very knowledgable. 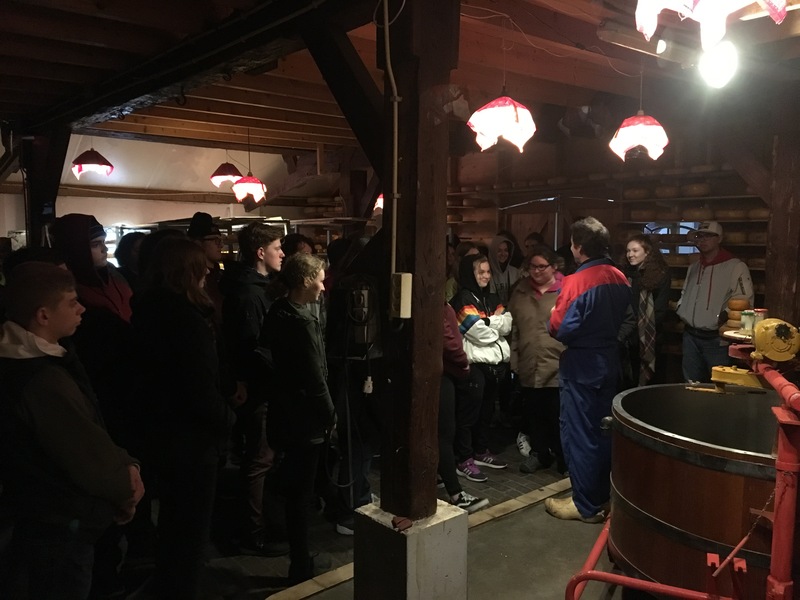 We were able to see some places we were not able to walk to and then made our way to the Rembrandt Hoeve (House), which is a cheese farm. I’ve been there before, and it is quite the place. 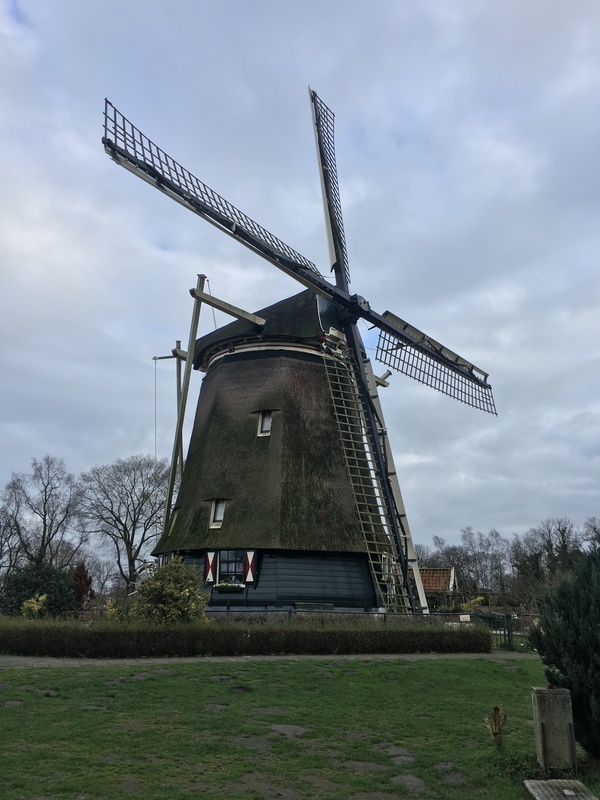 They make some amazing Gouda cheese and traditional clogs. I think the kids really enjoyed it, and many came away with souvenirs and cheese. I did have a couple near relapses during the tour, where I almost nodded off. I even put my sunglasses on to mask my condition; thankfully I powered through it. 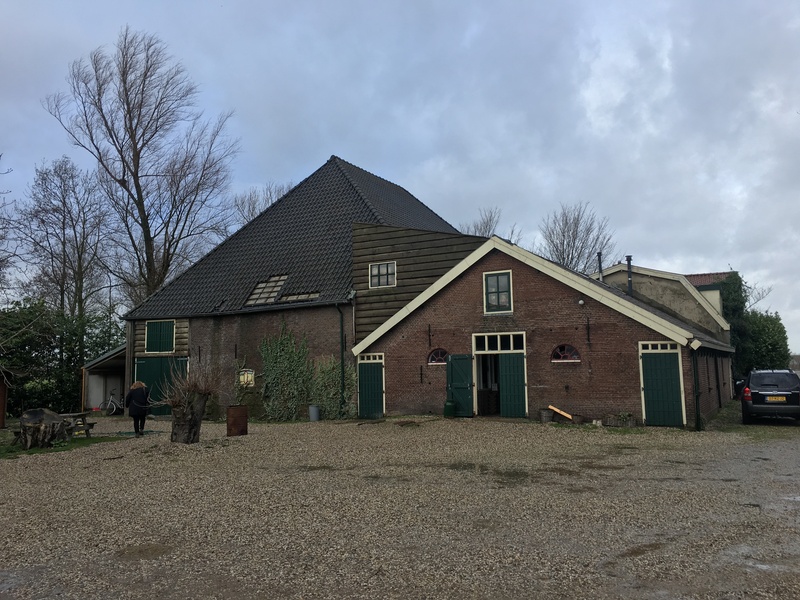 Rembrandt Hoeve, Amsterdam, March 2019. The tour ended around 500, which left us some time to get off the bus and look around before we went to supper. 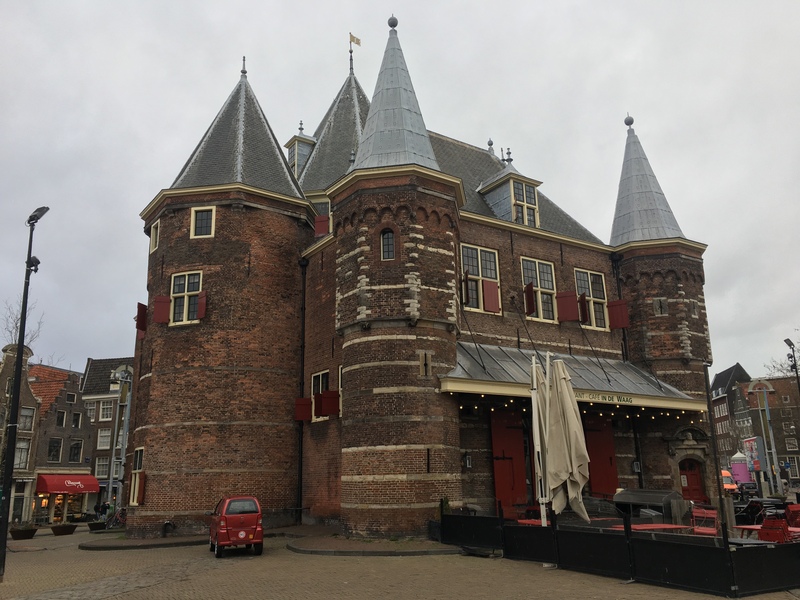 Did I say how much I love Amsterdam? By that time, it was still cool, but the sun had come out and it was a nice evening. 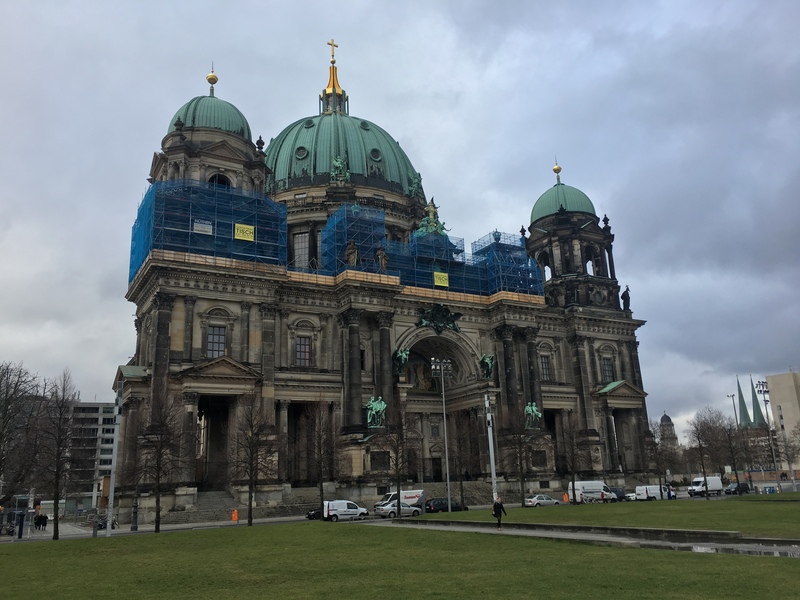 It is such a laid-back city, the people are super friendly and the sights are amazing. If I had to live somewhere in Europe, this would be the place. Do you ever wonder if you’d have done that? Like, at some point earlier in your life you decided to transplant yourself to another continent? I have no idea what I would do for a job, but it’s interesting to think about it. Dinner was at a place called Drovers Dog, which was a nice restaurant. Our meal consisted of chicken (kip in Dutch) skewer with peanut sauce, rice and vegetable garnish. My colleagues gave it a 9 out of 10. Hopefully our dinner in Ypres tomorrow is equally as good. Anyway, it’s Tuesday and I’m completely exhausted. But hey, who needs sleep right? I remember telling myself that at points in my life, like when I was in the army, when my kids were newborns (I still don’t know how my wife did it) and a few others I probably have forgotten. For a history teacher, I do have a short memory; I may have written the exact same words, well, more or less, on the last trip when I couldn’t sleep. Should have got my own room. Smothering a snoring roommate is still a crime over here right? Asking for a friend. Okey dokey, we’re now on the train to Amsterdam. It was quite the odyssey getting out of the hotel and to the train station. The hotel was supposed to have a bagged breakfast ready for us, but something got messed up and that went out the window. We were told to grab something quick from the breakfast buffet and then jump on the bus. I took us about an hour to get to the station, where we had time to buy more food for the ride. I picked up a couple chicken schnitzel sandwiches and even got to try out some German. Too bad we’re leaving as I was just starting to feel comfortable with some basic words and phrases. The train will take us to Apeldoorn and we should be there about 2pm. I guess we’ll have an opportunity to see the countryside, relax and hopefully sleep. 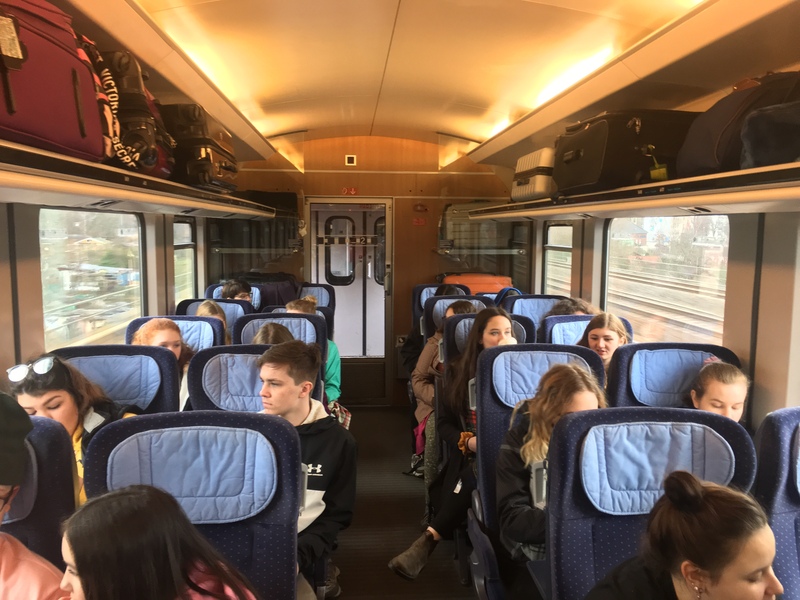 I never been on a train before, and I’m sure this is a new experience for many of our students. I’m sure it’s a great way to see parts of Europe. Anyway, time to get some shuteye. 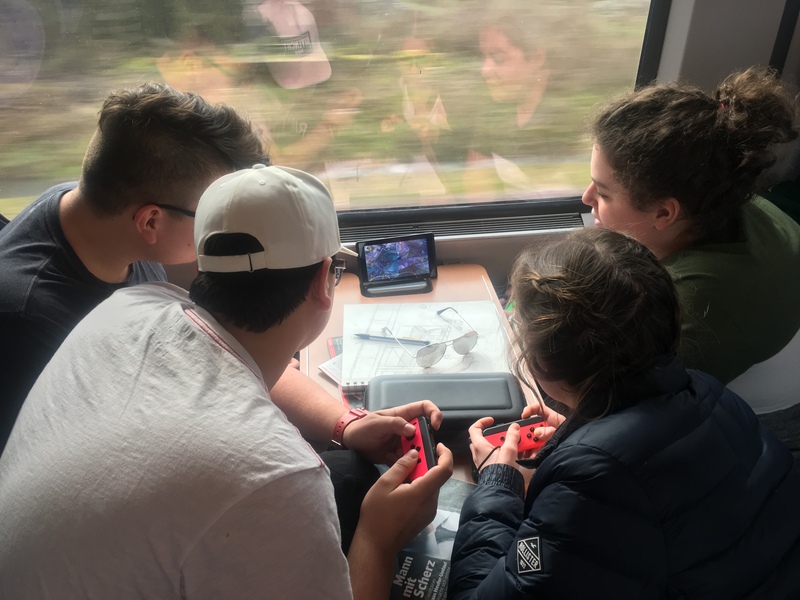 Scenes from the train, March 2019. 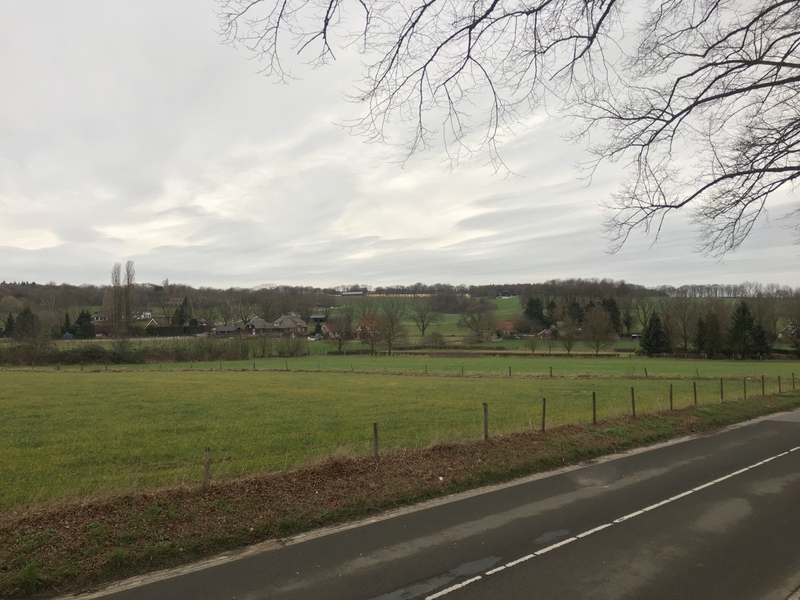 Alright, it’s now noon and we’re northwest of Münster near the German-Dutch border. That means we have another 2 hours before we arrive in Apeldoorn. I did manage to get some rest, which we won’t call sleep as I don’t think I really did. I do feel a bit better, but I could use some proper nighttime sleep. We’ll see what tonight brings. I ate both of my chicken schnitzel sandwiches, which were delicious, but had very messy crusty buns. The sun was out for a while, then it clouded over and now it’s trying to peek out again. Hopefully it holds until we get to the cemetery at Groesbeek. The kids seem to be enjoying the opportunity to relax, sleep or just hang out; it’s quite the smooth way to travel. I even played a little Nintendo Switch with some of the boys, but I did as poorly as I thought I would. So we’re now on our bus leaving Apeldoorn and heading toward Groesbeek. The train ride was great, but it was getting rather stuffy on board, so it nice to have some fresh air. The bus we are now on will be our home base for the next five days, until we reach Paris. Our driver is a Dutch fellow named Tish (I hope I spelled that right). The drive is about 60km, so we have a bit more time to relax. We’re back on the bus, on our way to Amsterdam. 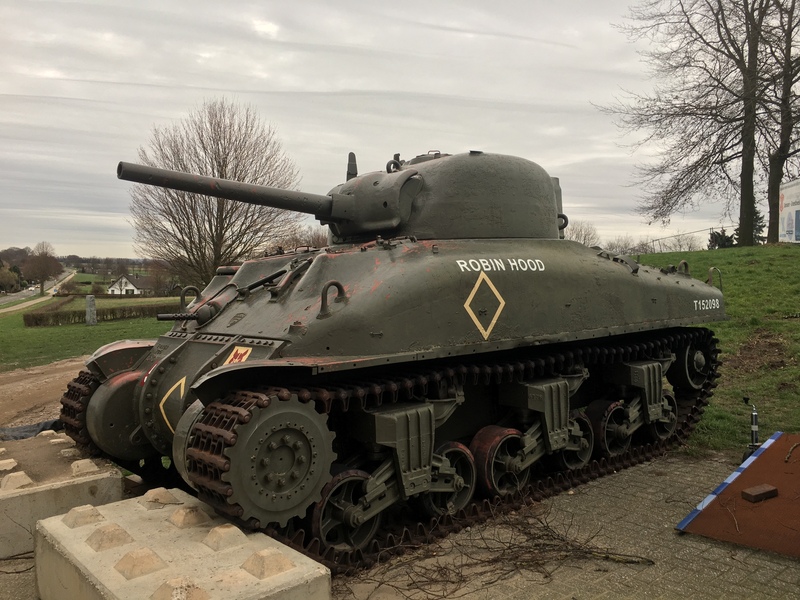 We first visited the Liberation Museum in Groesbeek, where we learned about the battles around the town, such Operation Market Garden and the Rhine Offensives. There was a very heavy Canadian involvement, especially the battles for the Rhine in early 1945. 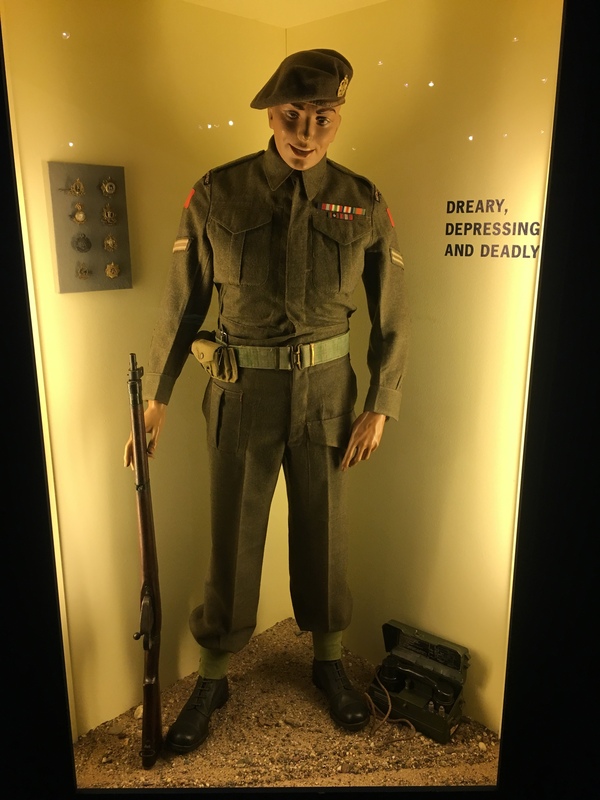 Liberation Museum, Groesbeek, March 2019. 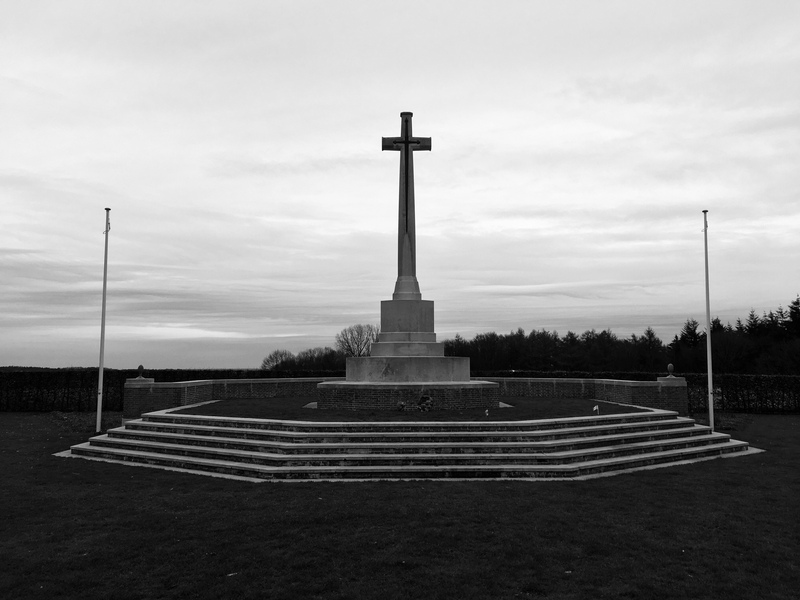 From there, it was a short two minute drive to the Groesbeek Canadian War Cemetery. Over 2600 Canadians are buried there, most killed in those battles along the Rhine. The cemetery is unusual, as most of the men died in Germany, but because the commander of the 1st Canadian Army refused to have any of his men buried on German soil, they were moved across the border to the Netherlands. Among those interred there are Sergeant Aubrey Cosens of the Queen’s Own Rifles, who was awarded a posthumous Victoria Cross for his actions in February, 1945 and Lieutenant Colonel Jeff Nicklin of the 1st Canadian Parachute Battalion, who was killed in the opening moments of Operation Varsity. Nicklin was a former member of the Winnipeg Blue Bombers. 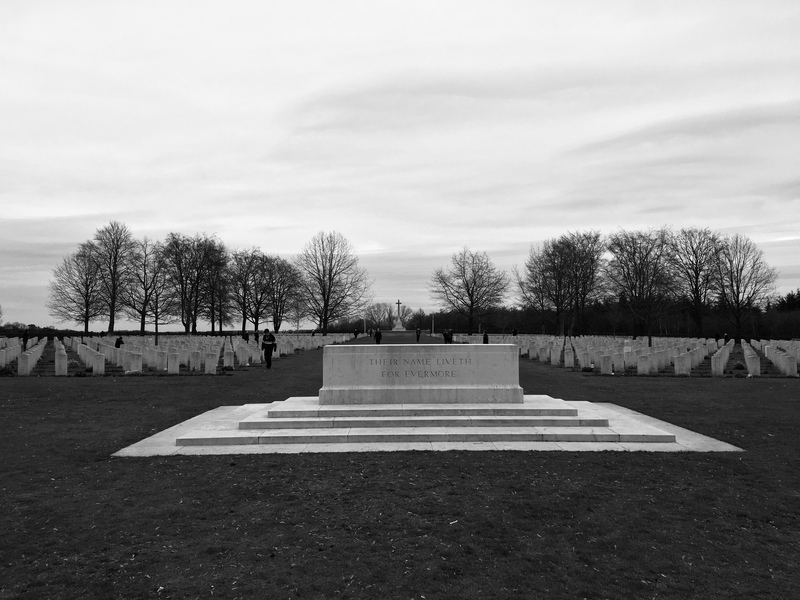 Groesbeek Canadian War Cemetery, March 2019. Grave of Sgt. 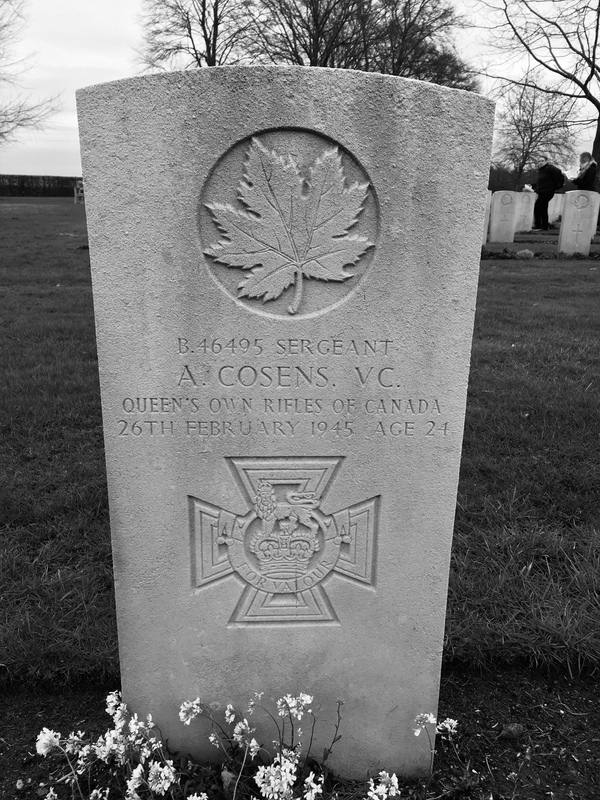 Cosens VC, Groesbeek Canadian War Cemetery, March 2019. 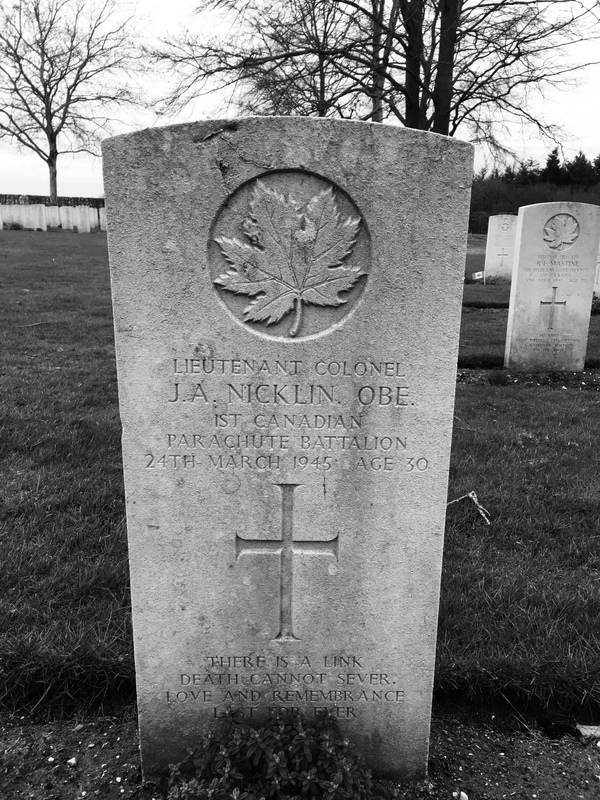 Grave of Lt. Col. Nicklin, Groesbeek Canadian War Cemetery, March 2019. Grave of L. Cpl. 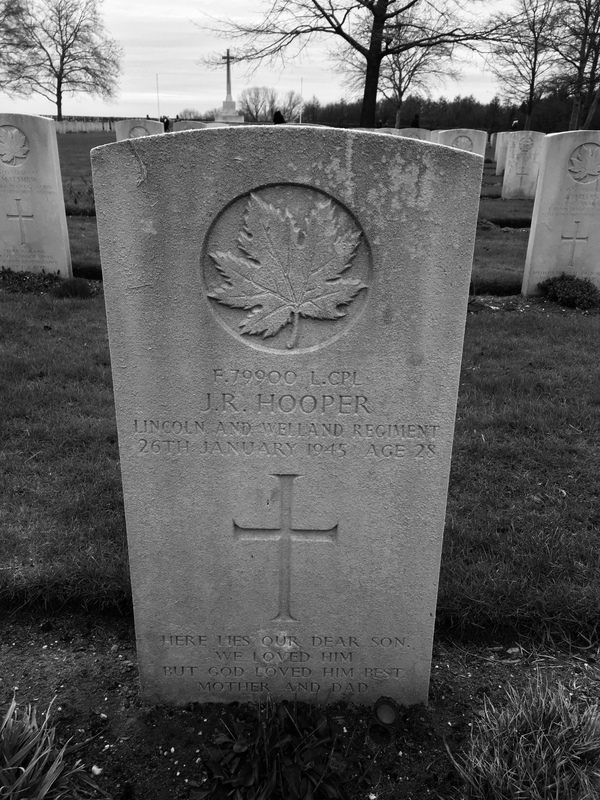 Hooper, Groesbeek Canadian War Cemetery, March 2019. Okay, we’re on the road for the final leg. 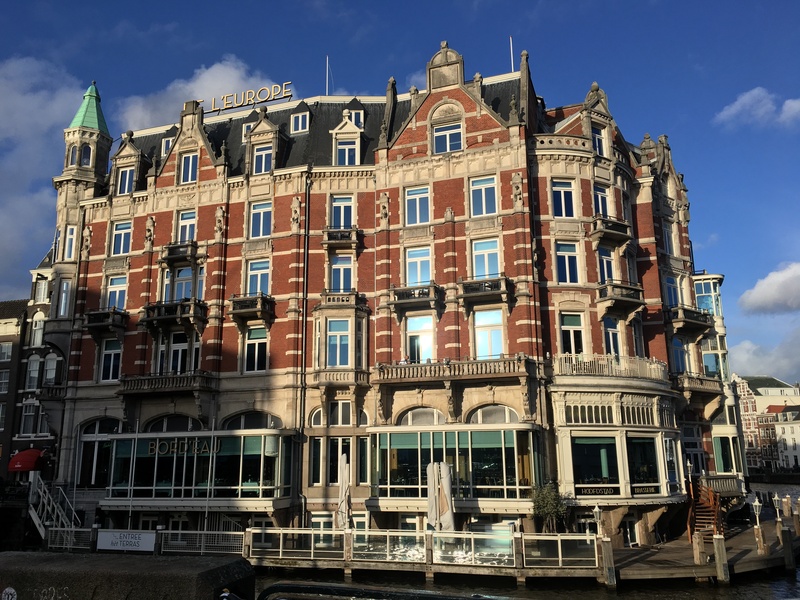 We stopped for dinner at a place called La Place in Enspijk. It was not a scheduled stop, as EF didn’t have a set restaurant for the meal. Sebastian gave us some options, and that EF would give us 15€ to spend. Turns out, we made a great choice. This restaurant was a buffet-style establishment that makes your entree while you wait. I had salmon with some type of sauce, fries, salad and bread with garlic butter. All for 17.30€, so it only really cost me 2.30€…nice! I did sleep, if you can call it that. The more pertinent question is regarding the duration and quality of that sleep. You know when you’re so tired you can’t sleep? I was falling asleep on the train ride back to the hotel, yet of course I was restless when I got to bed. It doesn’t help that my roomie can wake the dead with his snoring and falls asleep immediately, leaving me to lie awake and contemplate my life choices (see above). If the past trip is any indicator, I’ll eventually become so tired that the snoring won’t bother me. So we’re going to be heading out shortly for our day’s adventures. I just came back from breakfast, which is always interesting in Europe. It’s kinda like roulette, as you’ll never know what the quality and quantity will be like. Today, it wasn’t bad; lots of breads, some meats, yogurt and a few other things. Overall, I give it a B. 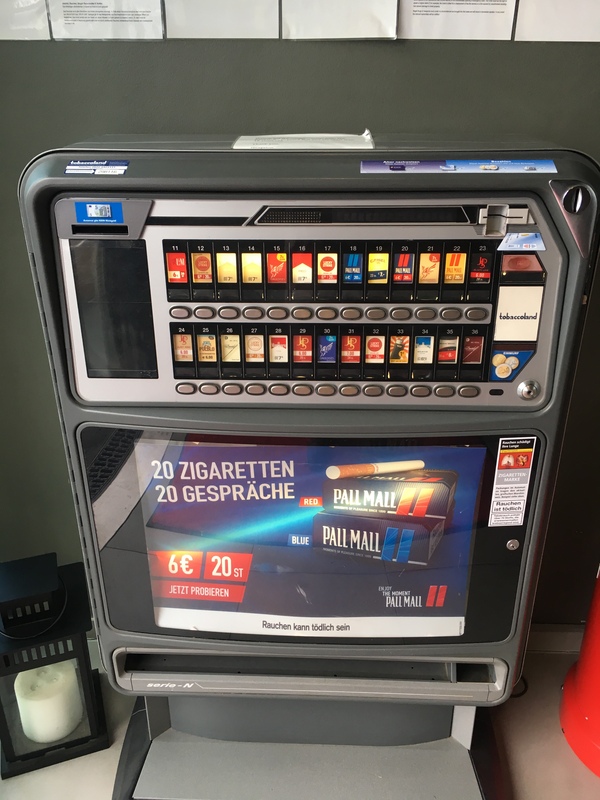 Still have these in Berlin, March 2019. Today we’re off for a tour of the city with a local guide. Hopefully the weather is a bit more cooperative. It’s not raining right now, so let’s hope that trend continues. The forecast for the rest of the trip doesn’t look very encouraging, but things can change quickly right? Okay, so we’re on the bus to Sashsenhausen, which is about 45 minutes away. We had a good morning, though the rain has returned…just in time to be outside. Anyway, we picked up a local tour guide, Forrest, who happens to be an American, to take us around the city. We saw many of the local sights, and stopped at a few. 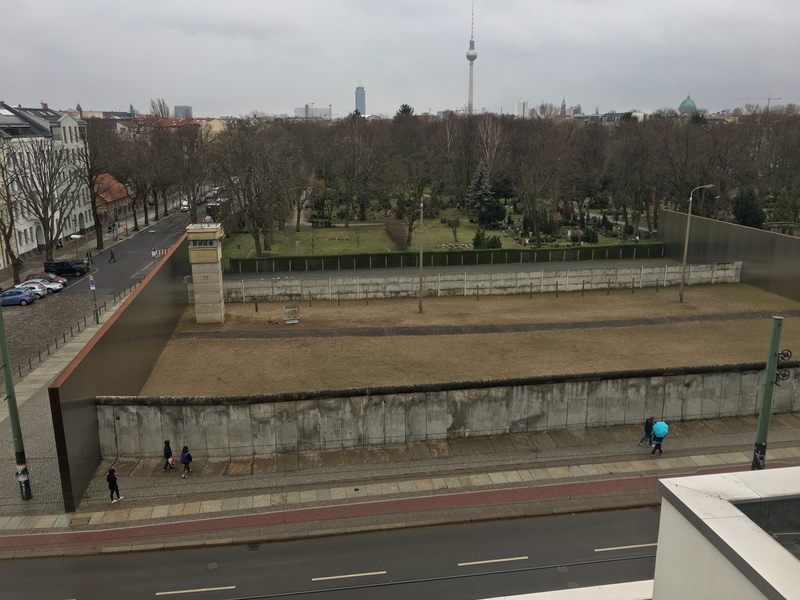 The notable ones were sections of the Berlin Wall, which obviously was a physical reminder of the Cold War. 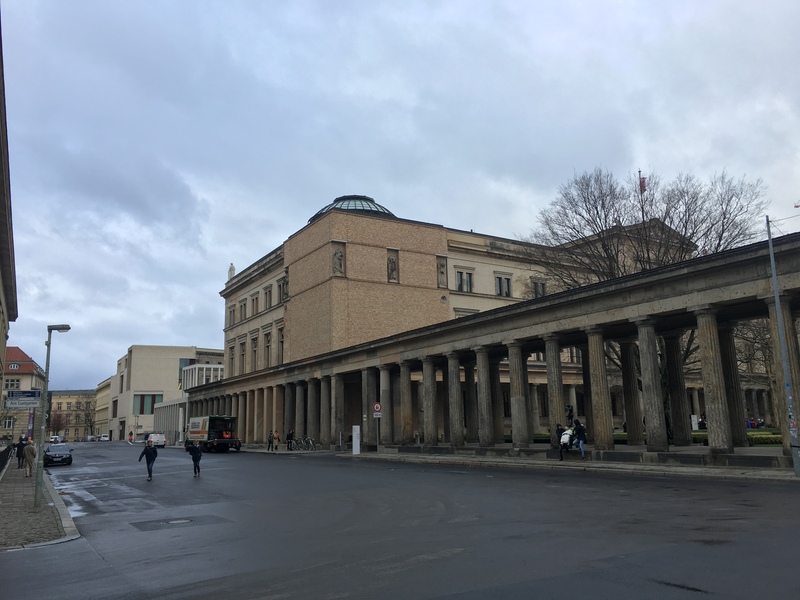 Battle scarred museum in Berlin, March 2019. We stopped at a shopping mall for lunch, and it was recommended that we try the Currywurst mïtt pommes, which is a fried Bradwurst covered with curry power and ketchup, with fries and mayonnaise sauce. I had my misgivings, since I’m not a huge fan of curry, but it was awesome. Definitely recommended! 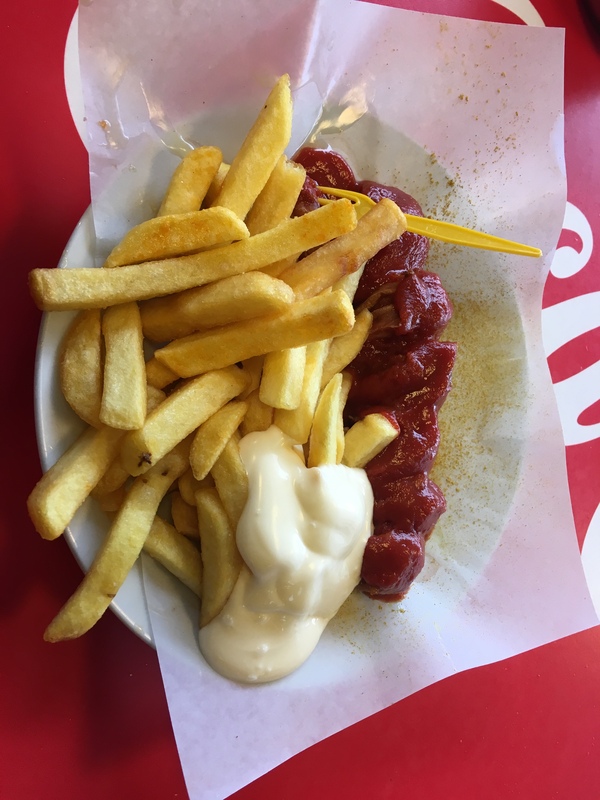 Currywurst mïtt pommes, March 2019. 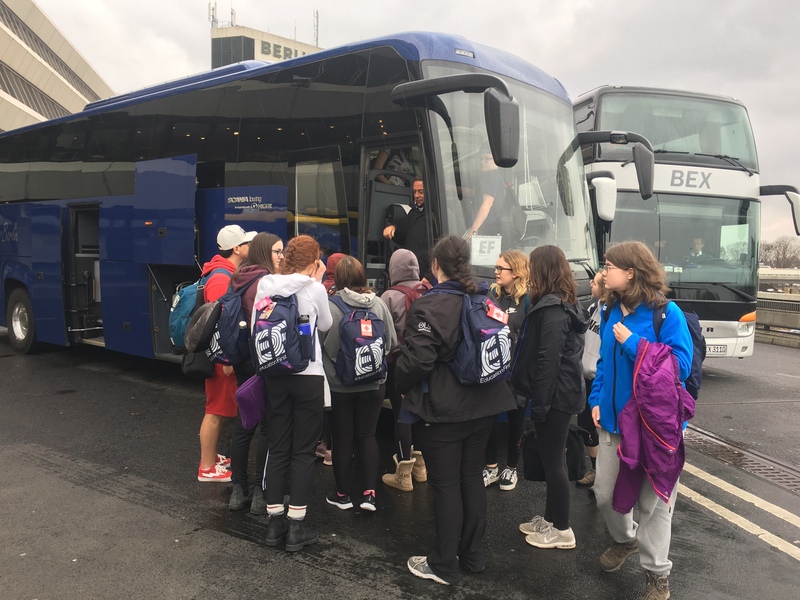 We’re back on the bus after our visit to Sachsenhausen. We are again tired, wet and chilled to the bone. As bad as we feel, I think the weather was a fitting tone for where we were. 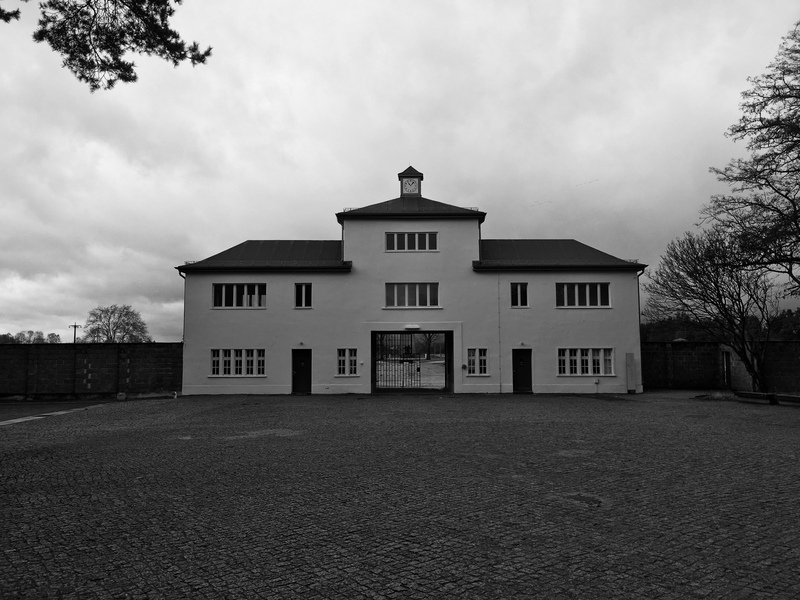 Sachsenhausen was one of the first concentration camps established, and the first to be laid out exactly to a plan. We had two guides for the tour, Forrest and another, Wouther. Forrest was our guide with the St. Pats group, and he did a amazing job explaining the history of the camp. It started off fine, cold and damp, but dry. 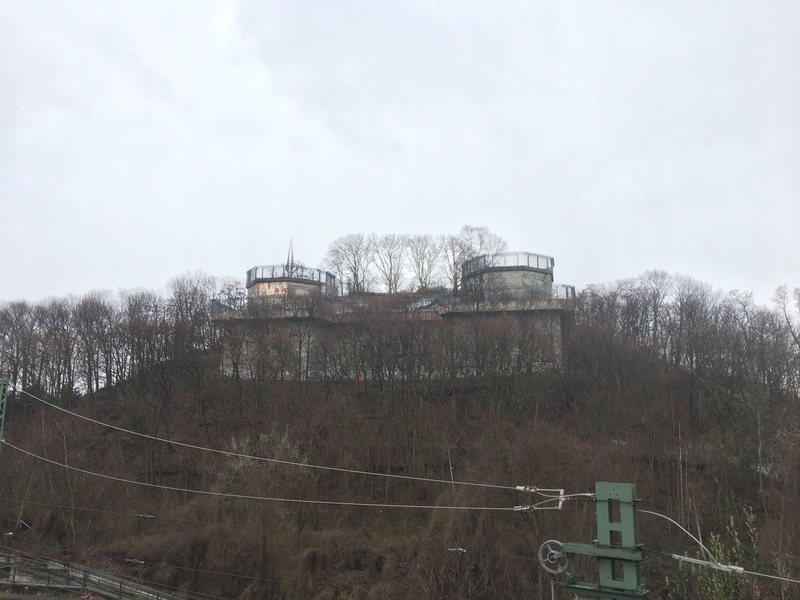 We learned about how this camp was mainly for political prisoners starting in 1936, but later both Soviet POW’s and Jewish civilians arrived as well. Some of the structures of the camp survive, while others are commemorated. We saw the main gatehouse, some of the barracks and the remains of the crematorium. It’s estimated that more than 200,000 people passed through the camp between 1936 and 1945, and roughly 35,000-40,000 died there, including 13,000 Soviet POW’s. Halfway through the tour it began to snow, then escalated to a blizzard. The temperature was +3C, but it felt like -2. Soon the snow turned to pouring rain. I was very grateful I had an umbrella, but the whole time I imagined the poor prisoners held at the camp being worked hard in the same conditions, dressed on in one layer of clothing. 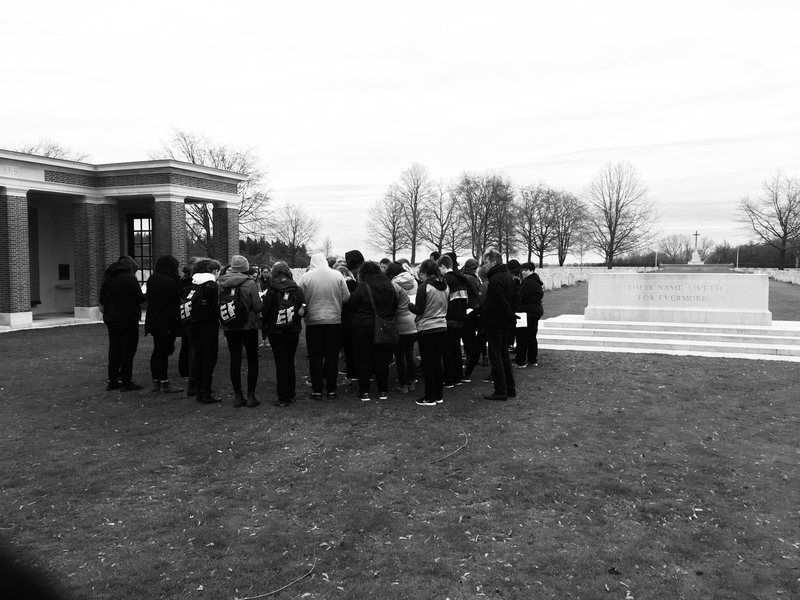 I think the camp, the tour and the weather were all very sobering for students and teachers alike. Main gate, Sachsenhausen concentration camp, March 2019. 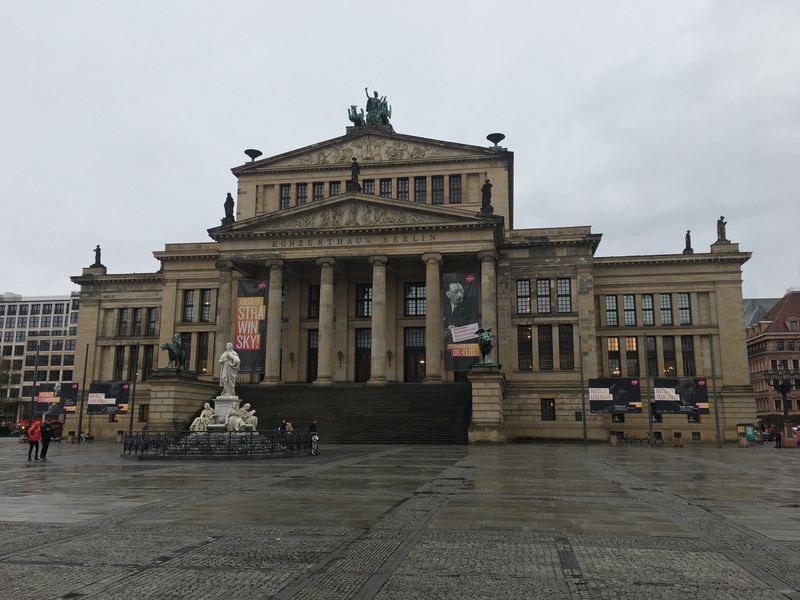 After arriving back at Alexanderplatz, we made our way to a local mall where we had dinner. I can’t remember the name of the place, but it was similar to the night before. Some sort of hamburger-ish thing with rice and some sauce, and coleslaw. Nothing spectacular, but palatable. Dessert was some yogurt with strawberry sauce, which I thought was good. We left the restaurant and made our way to the train station. So, if the kids had never rode a train/subway before, boy they are well versed now. 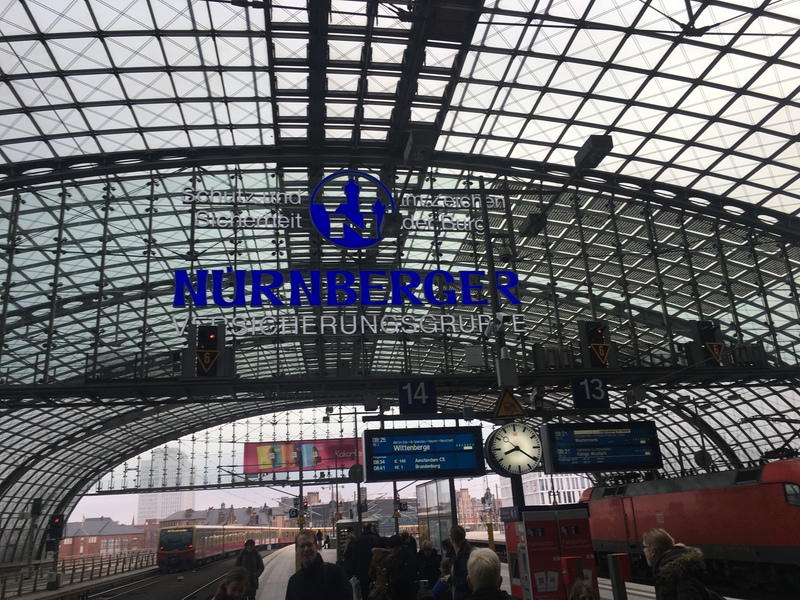 To get to our next event, a Cold War discussion, we had to take several different trains to get to Südstern. 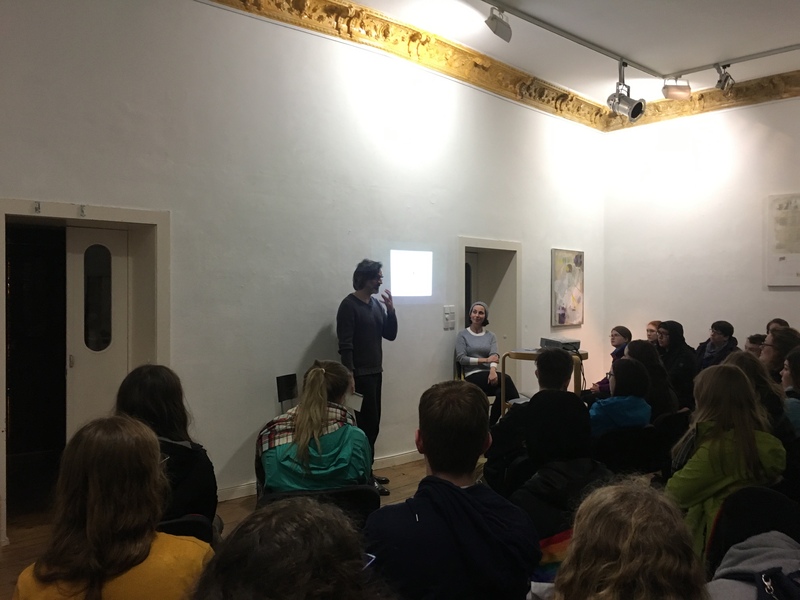 Our presenters, Peter and Emme, were residents of West and East Germany respectively. 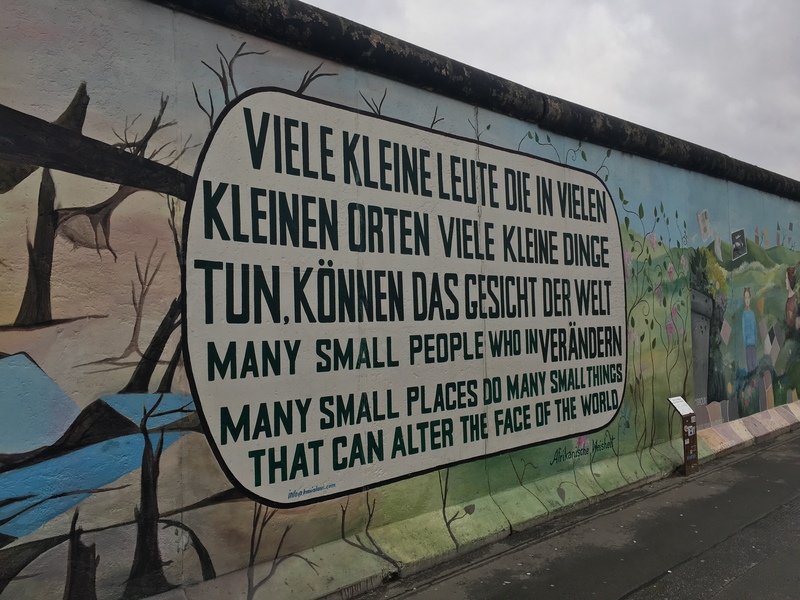 They described the rise and fall of the Berlin Wall and how it effected them. 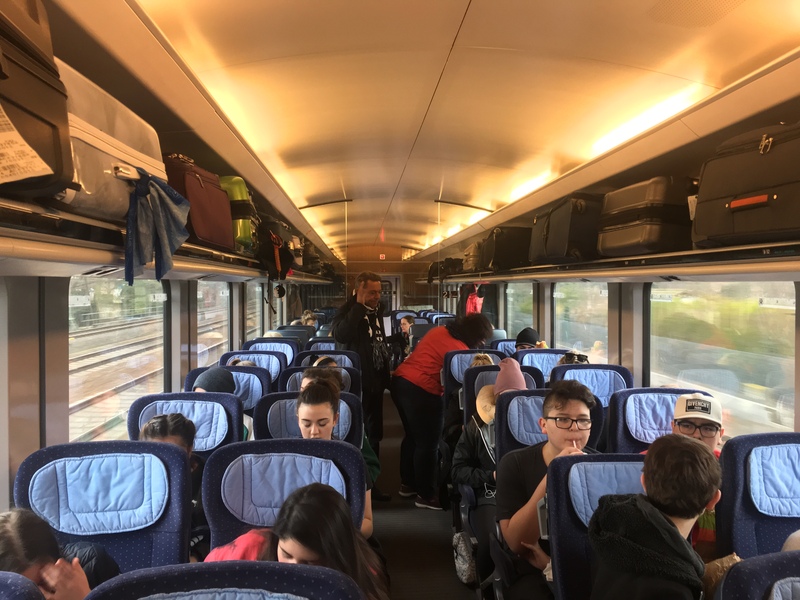 Afterwards, it was back on a couple different trains to get to the stop near our hotel, Grünbergallee. Cold War discussion, March 2019. I think they’ll be serving breakfast soon. Hmmmm, what’s on that menu. It’s continental, so probably not much. I remember getting banana bread and water one time. Sounds about right. Anyway, I’ll be back once we’re on our flight to Berlin. Alright, on our way to Berlin. Boy do I have a story for you! First, the rest of the flight to Munich was uneventful. I did call the banana bread breakfast. It was pretty good, though not chocolate chip banana bread good. Anyway, we landed on time and made our way off the plane as quickly as we could. That’s when the fun started. As I mentioned earlier, I was worried about the time between our flights. 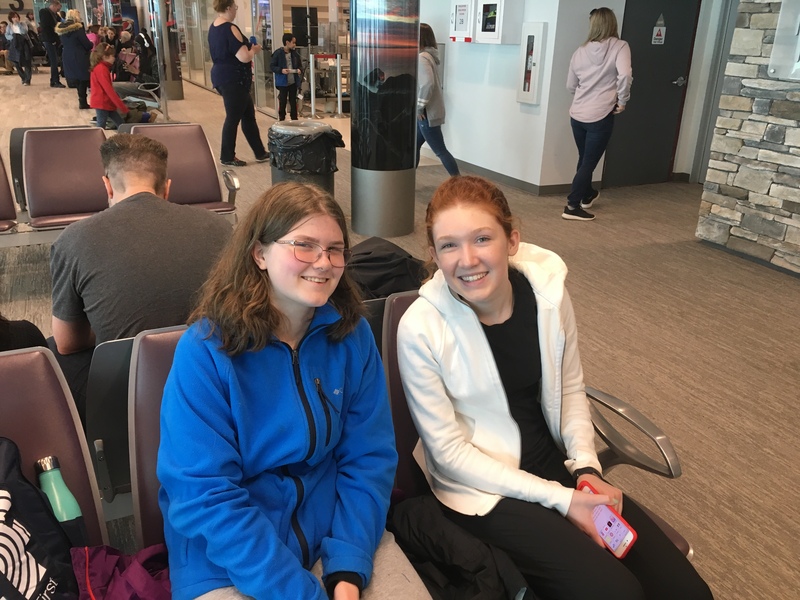 If I thought Thunder Bay to Toronto was tight, fate said “hold my beer.” We only had about 50 minutes to get to our next flight, and there was a massive line at customs. I didn’t time it, but it took us more than 30 minutes to get through the queue. Then we had to take a shuttle to the gate, and literally run to make it there. What a gong show! 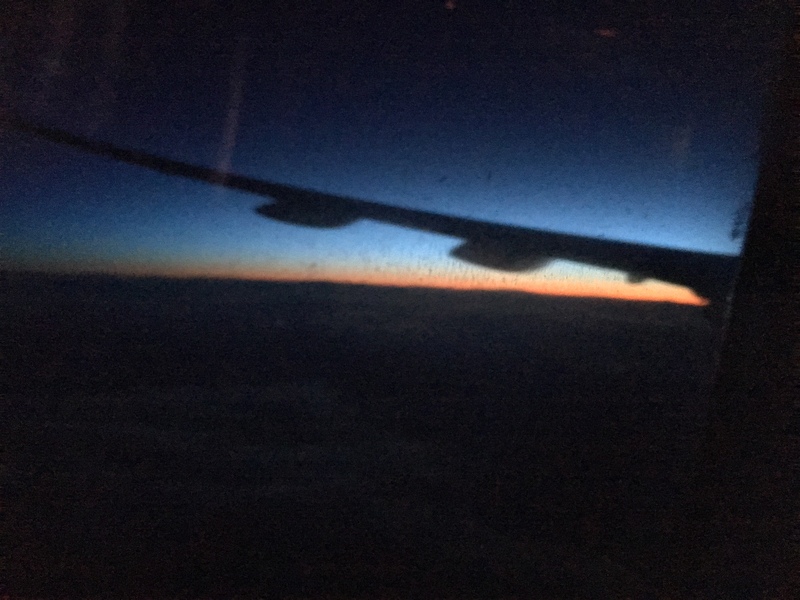 When we finally got there, and thankfully they held the plane, one of the Lufthansa people said us “What took you so long? Your plane landed an hour ago!” Uh, we have to get off the plane and through customs. Hello! Anyway, we’re on our way with everyone in tow. I don’t know about anyone else, but I need a shower. I am sweaty and gross! Problem is we can’t check into the hotel yet, so hopefully we can fresh up somewhere. I’m beat too. The running and stress take a lot out of you, oh and the lack of sleep too. Oh well, we’re in Europe instead of snowy Thunder Bay, so we’ll make the best of it. 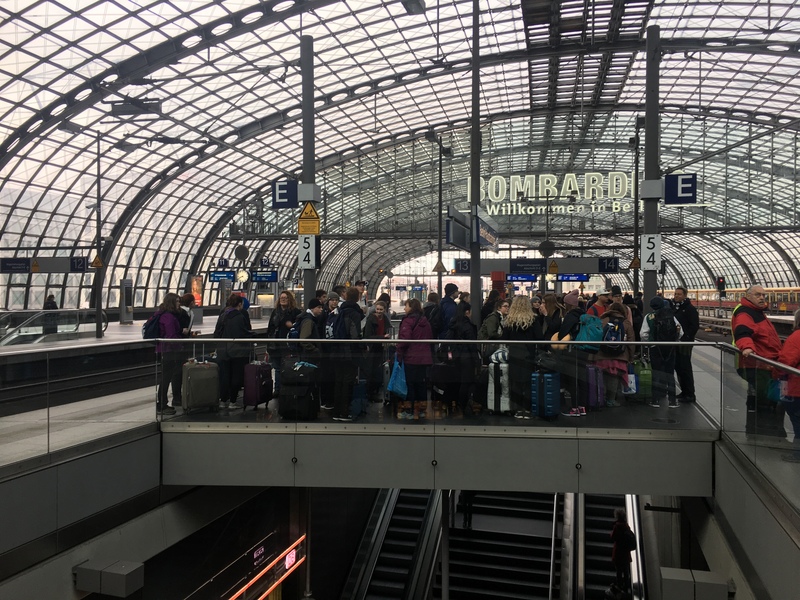 Leaving the Berlin airport, March 2019. Our method of transport for the day was the train, which I’m sure was an experience for some of our students. The only issue unfortunately was the weather. It started drizzling when we landed, and continued as we left the hotel. I did stop for a bit, but then came down even harder. Definitely not one of the best weather days I’ve had in Europe. If you’re wondering where we went and what we saw, I’ll tell you. 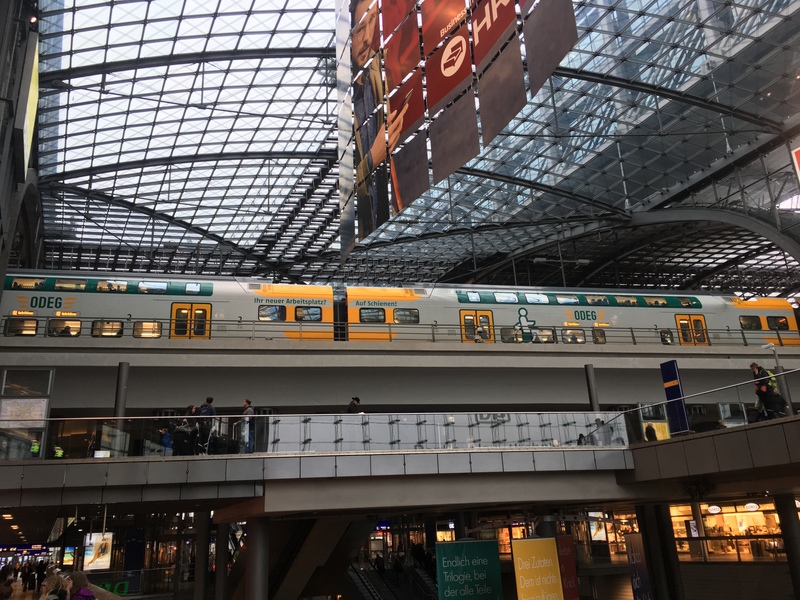 We took the train from our hotel, which is located in the southeast of the city, to the centre of old East Berlin, Alexanderplatz. Riding European public transit is so different than in Canada. 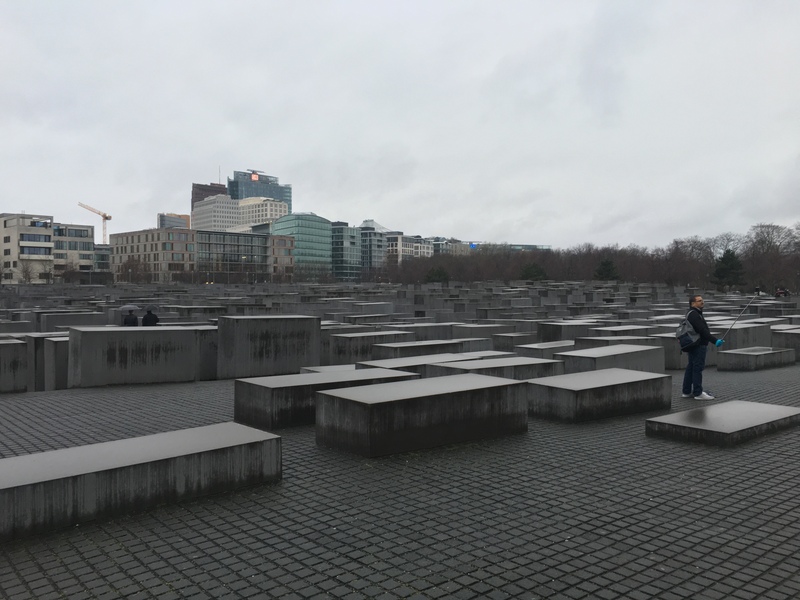 Anyway, from Alexanderplatz, we did a walking tour of the area, stopping at many historic sites, including the Holocaust Memorial. 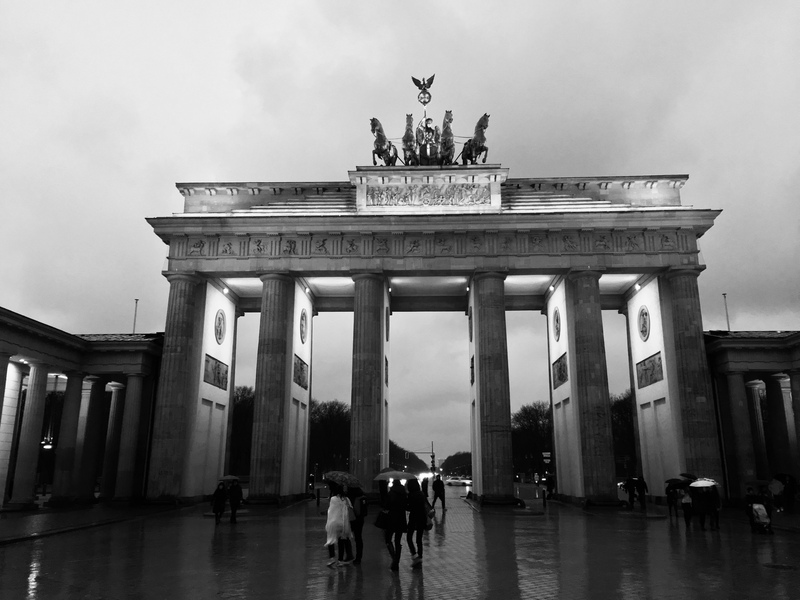 My favourite was definitely the Brandenburg Gate, but sadly it was raining so hard that we didn’t linger very long. We all were hungry and cold, and really wanted some food and to get out of the rain. Dinner was at a restaurant called the Hopfingerbräu. The meal was meh; 3 sausage links, some sort of meatball shaped like a hamburger patty and some potato salad concoction. I ate the first two, but was disappointed like others were that the potato was cold and didn’t taste very good. Dessert was something akin to a black forest trifle which I thought was good, but then again I like Black Forest cake. Hey kids, today is the the day! I know this isn’t my usual introduction, but it is a special circumstance. This time tomorrow morning, we’ll be in Munich on our way to Berlin. For my part, there is a lot of nervous excitement. Even though this is my fourth trip, I still stress a bit about all the little details. I just got back from a 4.5k walk with Luna; the morning couldn’t have been more beautiful. You can tell that spring is on the way. The temperature is near zero and the sun is shining brightly. I actually had to start stripping of some layers as I was overheating. 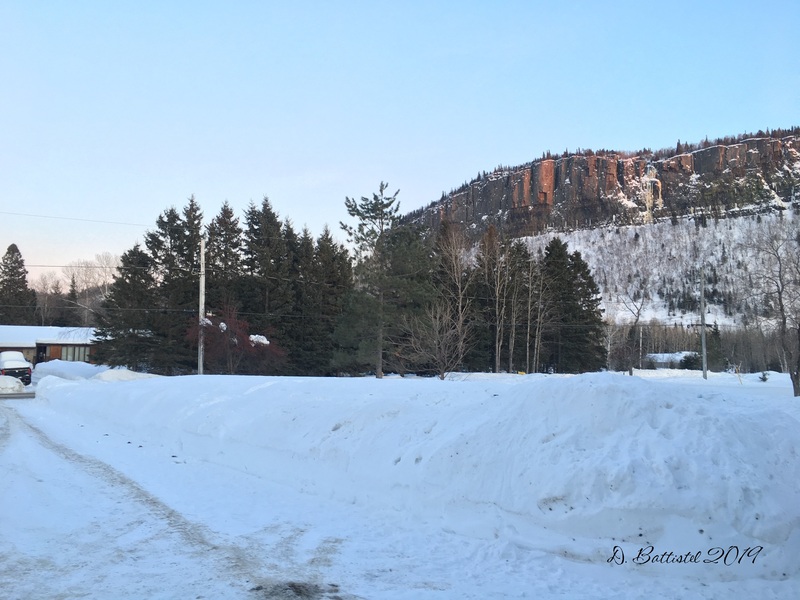 They are calling for some snow today into tomorrow, but hopefully with mild temperatures next week it will go away quick and work on the mountains we already have. 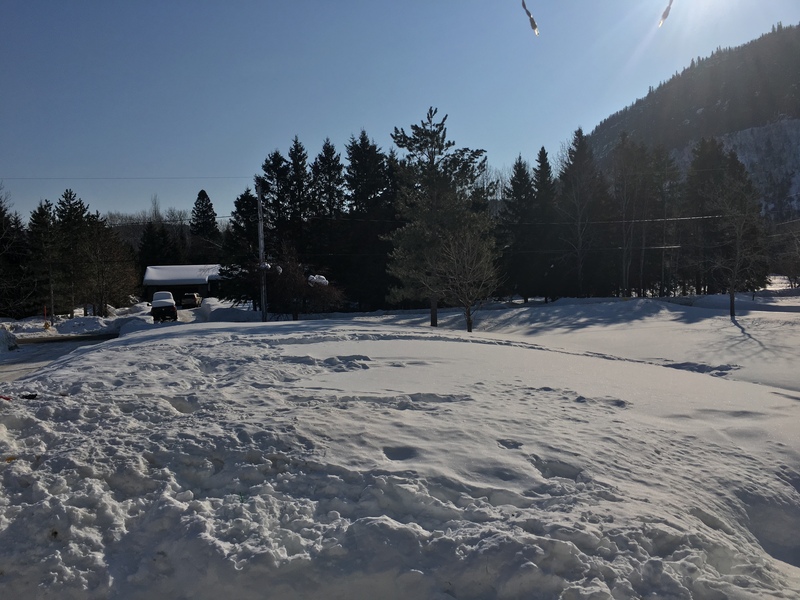 Late winter morning, March 2019. So I think I’m ready to go. Yesterday I checked everyone in and printed all the boarding passes. I’m pretty much packed with just a few minor things to tuck away. We’re meeting at the airport at 3pm, but our flight doesn’t leave until 5pm, so it’s like my old army days-hurry up and wait. Anyway, I’ll check in again once we’re on our way to Toronto. Alright, so we’re in the air on our way to YYZ. Unfortunately we’re 15 minutes behind schedule, which isn’t a huge issue, but it means we only an hour between flights. We’re going to have to hustle to get to our next gate, which because of where we land at Terminal 1, is quite the hike. Wish us luck! It was great to see the kids all excited as we waited to leave. 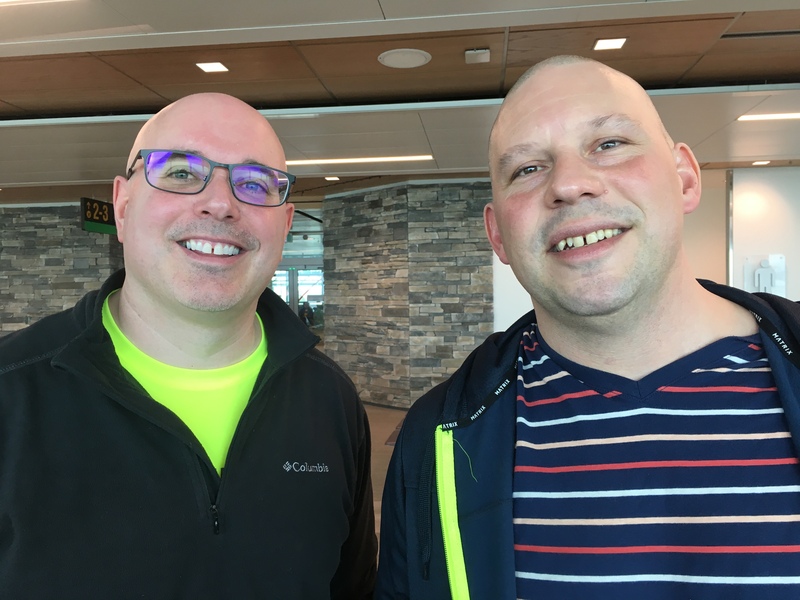 Some have never been on a plane before, others have never gone this far. I can just imagine what an amazing experience this is for them. I think for the majority, this is the first time away from home without their parents. I’m trying to think about the time I travelled when I was in high school, what my emotions were, but sadly it was such a long time ago that I don’t remember those fine details. 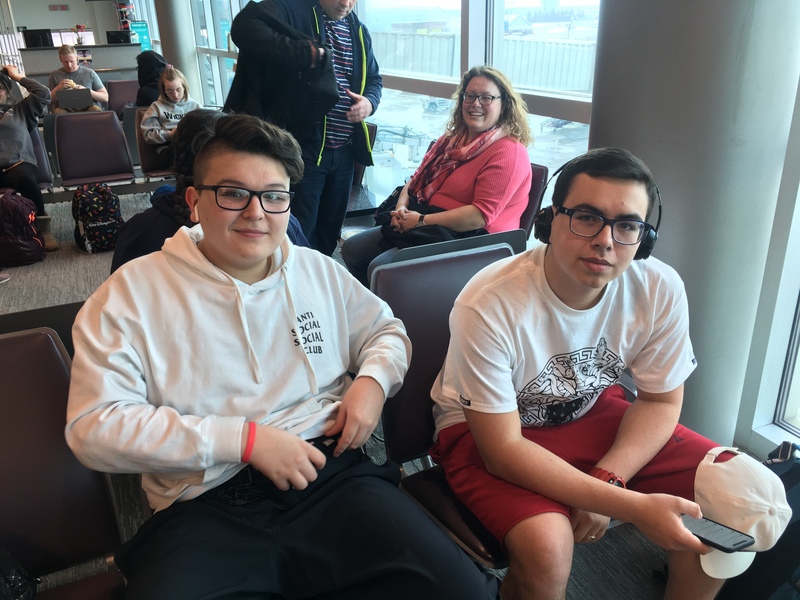 Waiting for our flight, March 2019. 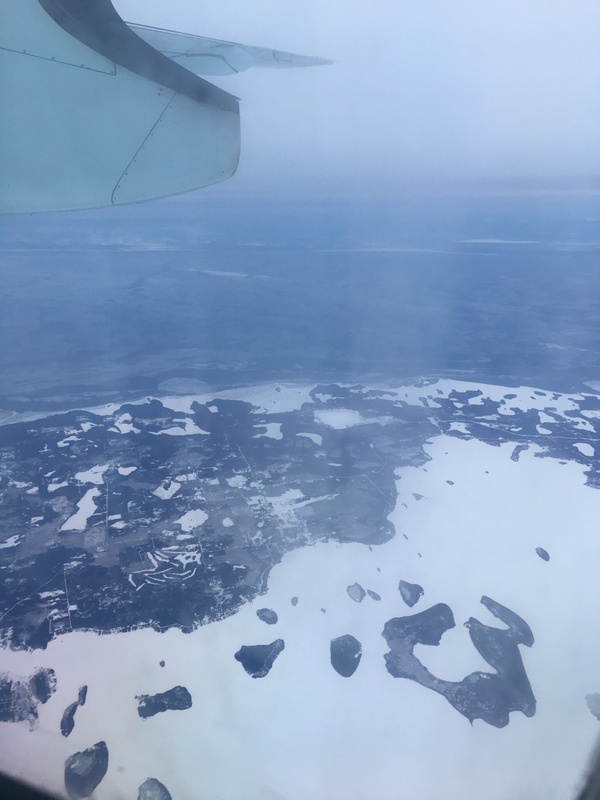 Somewhere over the lakes, March 2019. Okay, we’re in the air and on our way to Munich. 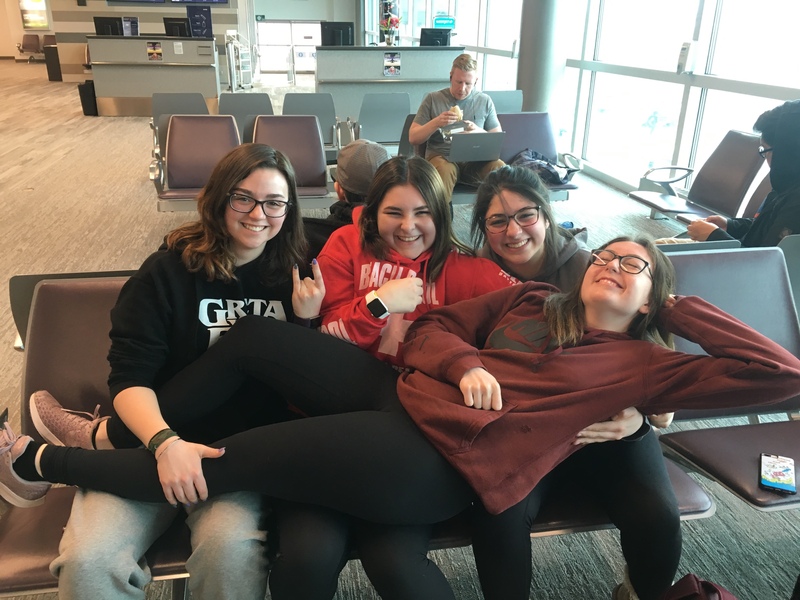 By the time we landed In Toronto and got off the plane, we had to rush like crazy to get to our gate. I knew the short time between flights was going to bite us, and it did. We made it okay, but the stress was not helpful. The flight is packed! Now we left late, like 40 minutes late, so I have no idea how that is going to impact us when we arrive. 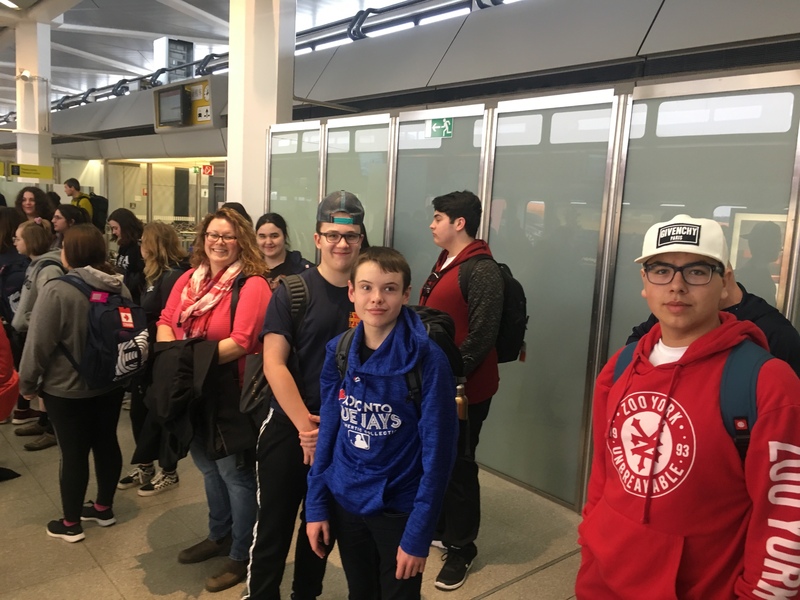 According to our itinerary, we only had an hour to make our next flight, that is after clearing customs and security. I have a feeling we might not make our plane to Berlin; ugh, I hate all this rushing around! The pilot said we would be on time, so here’s hoping. Well, they will be serving dinner soon, so maybe some food will soothe some of the frustration. I’m starving…I wonder what is on the menu? I guess it doesn’t matter, since by the time they get to us at the back, there won’t be any selection. Ah, the joys of steerage class! Okay, so colour me surprised. Dinner was not too bad, and they had options when they got to me. Huh. Well, at least one thing went well. We had the option of chicken or pasta, so I took the chicken, which had some sort of cream sauce with potatoes and veggies. There was also potato salad I think, with bread and a brownie. Not five star, but it will definitely hold me over. Well, not physically, because that’s impossible, but you get the idea. I would certainly love to go anywhere I please, at any time, but I’ll guess we’ll just have to leave that to Lenny. In any case, I am thankful I will be able to get away for a little while. Hey, it’s March kids! That means we’re weeks away from “spring,” that is if it ever shows up. It obviously will, I’m just being facetious, but the point is that it can’t come soon enough. March also means that we’re on the downward slide in the school year, and before we know it, it will be June. Things are going well in that respect, just as usual, I’m quite busy. Since I brought it up, I might as well talk about the weather, especially as I never do that! The weather has been, you know, not great. Better than it was in the last post, but still not what it should be. It’s still cold outside, but you can see that the seasons are changing. The days are getting longer, and even when it’s crisp, you can feel the warmth of the sun. According to the meteorologists, the temperature should start moderating this weekend and be above zero by next week. The only concern is that if it warms too quick, with all the snow we have, it might get a bit soggy . Lat winter snow, March 2019. So I’m still plugging away on the railway front. Progress is slow but steady, and I am now approaching 50,000 words in the book. Chapter 13 is mostly complete, save for a few tweaks, so that just leaves 1, 10 and 14 that require some work. I should be able to finish Chapter 14 this spring, so with any luck I’ll be done everything by next winter. As I’ve described before, everything depends on when I can get to Toronto and get more detailed information on Camp 8. Alright, so let’s fly away shall we? I am mere days away from another adventure in Europe. I described our journey in my last post, but now a few days out, it all seems very real. I know the kids are super excited, and they should be. 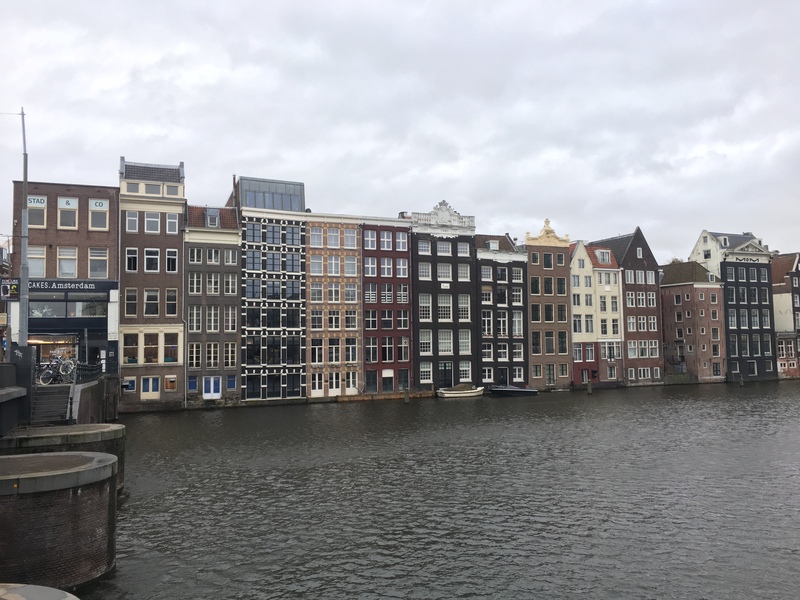 I’ve been to most of these places before, save for Berlin and some parts of the Netherlands, but likely most have never been overseas. As a teacher, this is the best part for me, to see them experience the history and culture of another part of the world. The only thing that concerns me is the weather (ya, I know, shocker). Looking ahead, it seems that in contrast to some of our previous trips, the weather is not going to be 100% cooperative. Most days call for cloudy/showery conditions, which is not ideal, but we’ll have to make the best of it. Showers aren’t too bad, but if it decides to rain all day that will put a damper on things. We now for the most part have our detailed itinerary. The one thing that amazes me is that even though I’ve been to some of places before, we always stay in a different town or part of the city. It gives you a different perspective on things and keeps it fresh. Also, after the last tour in 2017, which coincided with the 100th anniversary of Vimy Ridge, it will be nice with a lot less Canadian tourists running around. Many of the places we visited we quite busy, which made it hard to linger and get a real good look around. 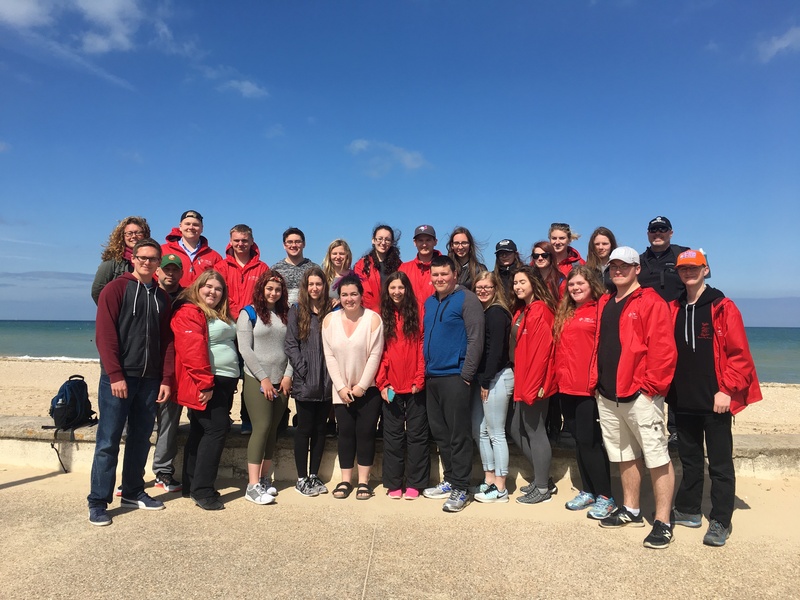 That was case with Vimy; while the ceremony was great to be a part of, we really didn’t have a chance to see the memorial or the park. I know my fellow chaperones are looking forward to the opportunity. 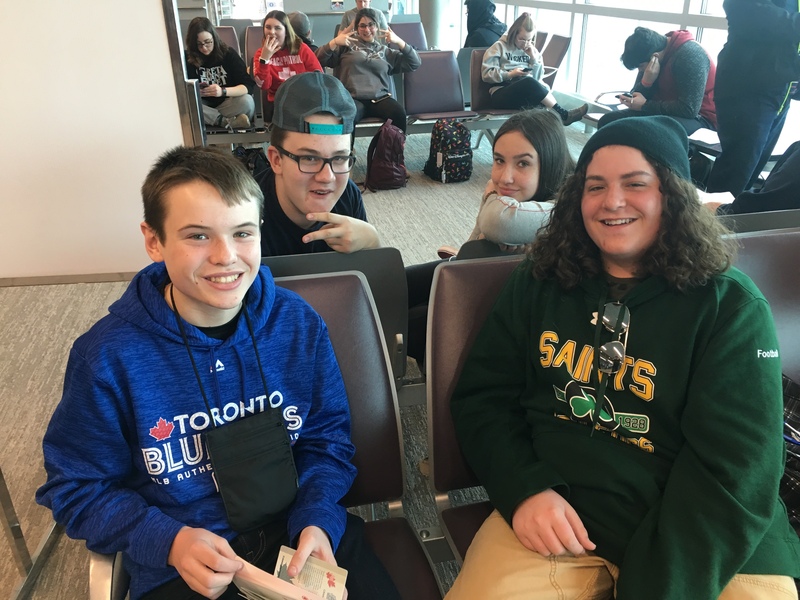 St. Pats group, April 2017. This week’s episode of our YouTube tour of the G&LS covers the section of line near Camp 4 of the Pigeon River Lumber Company (MP 1). Here the railroad passed through a long cutting and skirted alongside the logging camp as it hugged the shore of the lake. Remnants of the telegraph line are also visible.